This book is an ebook only and you can get it on Amazon or Ibooks. The author came to do an author talk at the school so I thought I would read it for background! I started off by thinking that, if you have an ebook what does that mean? Does it mean it hasn’t been picked up by a publisher? Do you decide to publish it yourself and see what happens? How does it work? Well, I still have no idea but it was an enjoyable read nonetheless! Gabriel Grant is a bit of a school loner. He is bullied by a pretty nasty group of boys and one day, in a bid to escape them, he runs into a factory place and is electrocuted by a power service station and ends up in hospital. When he wakes up he is confronted by a hells angel type bloke called the Searcher who tells him that he is a Morphant. 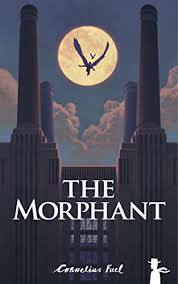 A Morphant is a person that change shape at will; not like a shapeshifter though. The Searcher is also a Morphant and his favourite shape is an owl, which teaches Gabriel (in the shape of an angel) to fly. Gabriel has special powers that enables him to change into any number of characters that he has thought of. Like a stretchy man or a giant bubble man. He basically has a bit of fun with this until his parents are kidnapped by evil clowns and he needs to go and rescue them. He takes his feisty sister Ariel with him and they investigate. Ariel is a fun character that you will identify with and she is always giving Gabriel a hard time! Especially when he borrows money from her. The book is a good romp; it has all the key elements that you want; adventure, excitement, baddies and killer clowns! The book is nicely set up for a sequel as well and the author was great at passing over his enthusiasm about the book to his audience. A quick and easy read that you will enjoy. Hello from Cornelius Fuel! Thank you for reading The Morphant and blogging about it! I’m delighted to say that The Morphant is now an audiobook, too (here’s a short snippet: https://www.youtube.com/watch?v=1IuDZvvj7tA&feature=youtu.be) … and the paperback will be published by Matador at the end of September! I’d love to read again this autumn, to a new set of Year 7’s, if Kew House, or another school in the borough is interested. Thanks again!